The king's birthday is a very festive occasion in the Netherlands, and Amsterdam goes all out to celebrate staging a street party which starts the night before and keeps going throughout the next day. 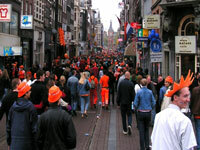 Traditionally, people attending wear orange (the Dutch Royal family is the House of Orange) and ensure they have a beer in hand. The party also resembles a giant jumble sale, with street trade unregulated for the day allowing people to display all their unused and unwanted goods on the street in the hope of selling it to passers-by. It is a great day for bargain hunters and party animals alike, particularly if the sun shines. Live music and street performances abound. A really fun way to experience all the jollity is to spend the day on a boat cruising through Amsterdam's canals. It provides a wonderful vantage point and allows you to avoid some of the crowds and queues on land - although boat traffic is also extremely heavy.